Take twelve grown men and stick them in a room with no fans in the middle of a sweltering heat wave and you’re darn right, they’re going to get angry. Lock them in there while they debate an accused murderer’s guilt, potentially sending him to his own death, and that anger is bound to get blistering. As these twelve men sit opposite each other and the time wears on, patience wears even thinner. Soon, it becomes difficult to decipher whether it’s the heat or the pressure that is making everyone sweat. The room itself could implode from the amount of palpable tension in the air but yet somehow it doesn’t. 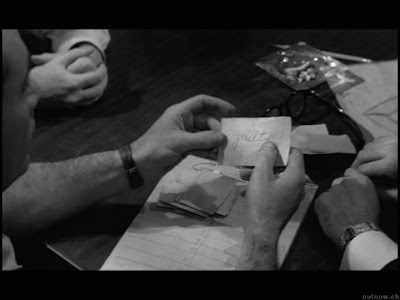 Take all of this and put it on film in 1957 and you have 12 ANGRY MEN, an unlikely triumph from a then unknown director. You would think only a finely honed director could maintain the kind of intensity 12 ANGRY MEN requires in order to be successful, but it is actually the work of a first time filmmaker. Sidney Lumet had worked in television for six years behind the camera when the producers insisted they would only go ahead with this project with Lumet in charge. 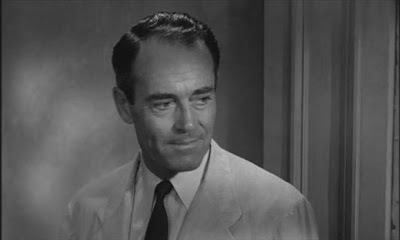 (Incidentally, the producers are writer, Reginald Rose, and star, Henry Fonda.) Lumet would go on to helm such influential classics as NETWORK and DOG DAY AFTERNOON, but he started his illustrious film career with this incredibly daunting task of a project. To increase the tension in the room as well as make viewers feel as if they were actually in it, Lumet shot the film’s earlier scenes with wider lenses but the later scenes with much tighter framing. This draws the viewer in subtly and eventually claustrophobia is rampant. It is this kind of thinking that would earn him his first of four Academy Award nominations for direction and deservedly so. Rose’s screenplay, based on his own original teleplay, is concise and calculated from the very start. He chooses not to divulge the trial details to the audience ahead of time. Instead, we learn about the trial at the same time as the jury picks it apart. The case at hand will decide the fate of an 18-year-old African American boy, who in 1957 was simply referred to as “one of those people” by a couple of the choice jurors. He is accused of stabbing his allegedly abusive father four times and leaving him for dead. A man upstairs heard a fight and the thud of a body hitting the floor while a woman in a building across the street saw the boy do it through her bedroom window. The evidence seems convincing and the boy’s history seems to point toward violent tendencies but it is the colour of his skin that connects all of these dots and proves his guilt beyond a reasonable doubt for every juror in the room but one. The sole holdout is Juror #8 (Fonda). He seems to be the only person of any true character in the room, or perhaps the only one brave enough to stand behind it. His inclination is leaning toward guilty but he knows something that no one else in the room does. He knows that everyone there accepted every supposed fact that was handed to them by the prosecution because the man on trial has black skin. He also knows that everyone had essentially made up their minds the moment they first saw the boy enter the courtroom. It becomes his personal mission to wake each individual juror up from their own prejudice without calling them directly out on it. To do so, he sheds light on each of the major points offered into evidence at trial and allows each person the opportunity to see that their judgment may have been unknowingly clouded. It’s only an open and shut case after all if you just shut it right away without opening it any further. 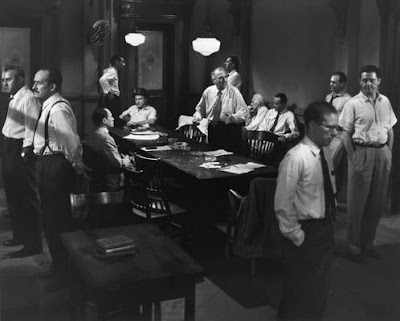 12 ANGRY MEN was not a success theatrically when it was initially released but is now considered by many to be one of the greatest American films of all time. The fact that it endures so well is a testament to its delicate craftsmanship and to the ideals it boldly stands for. Rose’s words are brave and resonate still to this day while Lumet’s approach allows for his audience to enjoy and participate in an experience not often had at the movies, a cerebral one. 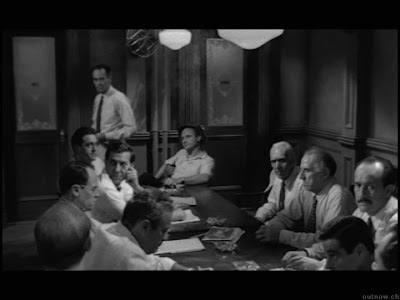 Sadly, 12 ANGRY MEN also still endures because if you were to take another twelve men and stick them in that same room today, I’m not sure the conversation would go so differently. Perfect score. Exactly! 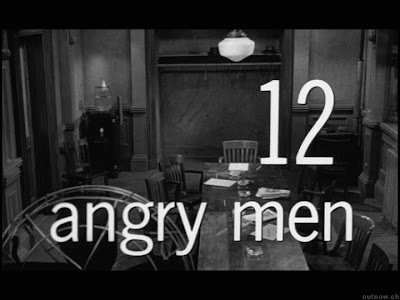 12 Angry Men is one of my favorite movies of all-time. Damn near perfect. What makes it even more remarkable is that it is Lumet’s directorial debut. Everything about this movie was great. Lumet truly did an outstanding job with it too. Everything from the cinematography to the story to the acting and the performance Lumet got out of his actors. I can never say enough about this movie. I had actually not seen this film until last week, on the day Mr. Lumet passed away. It is a bit of a morbid thing to do but what better time to jump into this fascinating picture. They just don’t make them like this anymore. This is on my Top 10 list for sure. The character acting is superb each man plies his craft perfectly. The directing, cinematography, writing and even the music all come together on this one. Yes, they don’t make them like this anymore. I don’t think it morbid at all to look up a recently decesed persons work, I think it is what they would hope you would do. Love it, thanks for the review! Indeed. Not morbid at all I don’t think. No different than gathering around remembering the good times with a loved one when they pass. In fact, I might go back to rewatch this (for like the 100th time) again soon. I’m not sure I’d say they don’t make them like this anymore. Just few and far between. Of course, a movie of this caliber and perfection was few and far between, period. Just a brilliant film. I can’t praise it enough. I’m glad you all don’t think it is morbid. I tend to agree with you but some people have said otherwise. I feel it the perfect way to honour the life by admiring the art.